The mysterious, magnificent colors of Antelope Canyon make it the most photographed slot canyon in the American Southwest. This masterpiece of color is located near Page, Arizona, and the Lake Powell area. We’ve looked at Canyon de Chelly National Monument and magnificent Monument Valley, but in Navajo Nation tribute part 3, we’re looking at Antelope Canyon. This is actually made up of two slot canyons. The Navajo name for Upper Antelope Canyon is Tsé bighánílíní, which means “the place where water runs through rocks.” Lower Antelope Canyon is Hasdeztwazi which in Navajo means “spiral rock arches.” Antelope Canyon was formed mostly by erosion of Navajo Sandstone due to flash flooding and water rushing through the rocks. 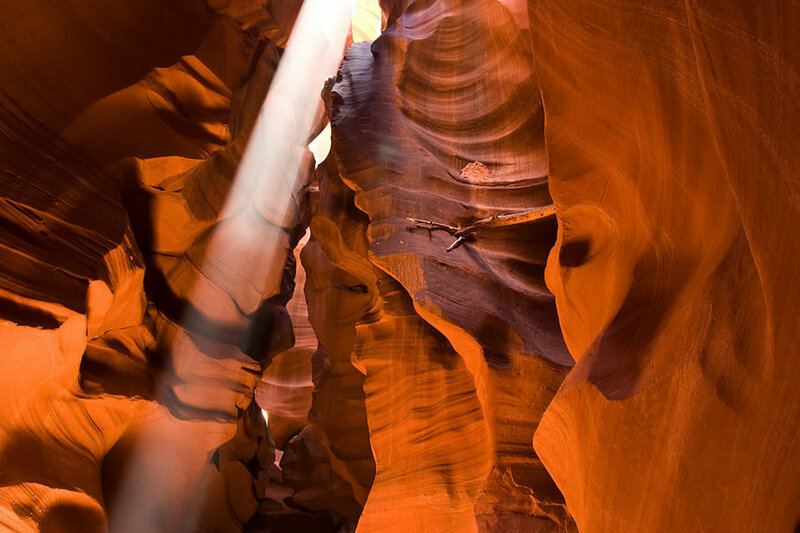 The risk of flash floods is but one reason Antelope Canyon is not accessible without a guide. Yet people come from all over the world to visit the Navajo Nation and to try out this photographic extravaganza.